List of members of Constituent Assembly Debates along-with the profile of few members whose speeches have been extracted in present volume. 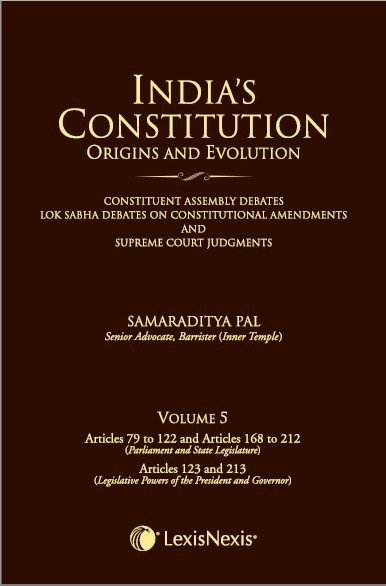 India’s Constitution –Origins and Evolution is the first ever book which provides a ready reference to Constituent Assembly Debates and the Constitution at one place. The analysis in the chapters provides a clear and interesting comparative picture as to how the constitution makers looked at the Constitution and how the Supreme Court has chosen to interpret it and how far both the visions are similar or dissimilar to each other. The book contains verbatim extracts from CAD, Lok Sabha Debates and Supreme Court judgments, thereby presenting facts in their true light. Intervention by the author is presented separately in the Overview. The book introduces contemporary reader to the legal greats of the freedom movement.